This image, painted between 1470 and 1471 CE by the Flemish painter Hans Memling, belongs to a category of images of Jerusalem which self-consciously use a stylized version of the city as a setting for biblical narratives. Using ‘simultaneous painting’, a style for which he was well-known, Memling has here depicted the entirety of the Passion and resurrection in twenty three scenes. 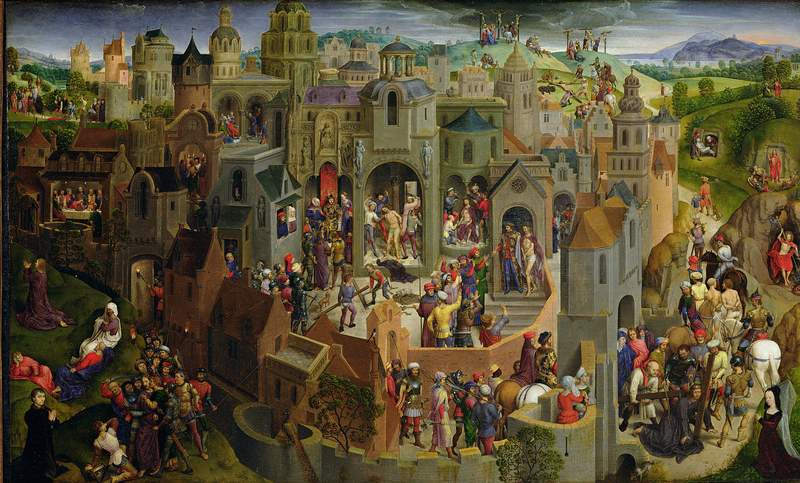 The earliest scene is the entry of Christ into Jerusalem in the top left hand corner. The narrative then unfolds via the Last Supper and the Garden of Gethsemane, also on the left side of the panel, moving towards the trial scene and flagellation in the centre of the painting before shifting outwards via the carrying of the cross and the crucifixion at the top centre-right. The three resurrection scenes all take place in the top right corner of the (comparatively small) panel. There is some suggestion that Memling based the layout of the city and the main sites on the report of Anselm Adornes’ pilgrimage to Jerusalem in 1470. Adornes was a friend of the painting’s patron, Tommaso Portinari, depicted in prayer in the bottom left hand corner of the image. At the time, it was possible to obtain an indulgence by making an imaginary ‘pilgrimage’ to the Holy Land by contemplating a painting such as this one, or Matthew Paris's itinerary map. In this image Jerusalem—translocated to fifteenth-century Bruges—thus functions imaginatively on two levels: it is an imaginary vision of Jerusalem via which imaginary pilgrimages could be made.